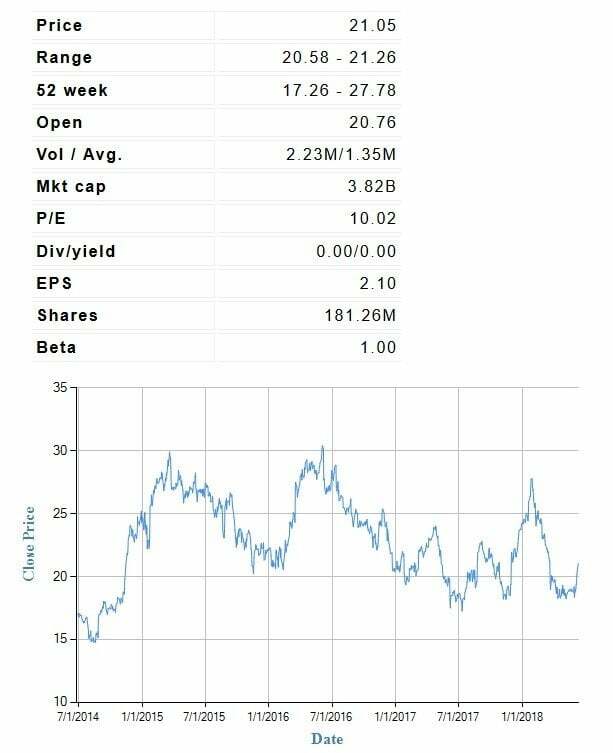 This Report was generated using the tools available on StockCalc.com. Patchell Brook Equity Analytics Inc. emphasizes that the user assumes all risks associated with the use of this report or the Stockcalc website including, but not limited to, all terms and conditions mentioned in the legal disclaimer. To access all of the tools on Stockcalc, including more detailed valuation reports and the models used to generate these valuations, please subscribe for a free 30 day trial of Stockcalc here. 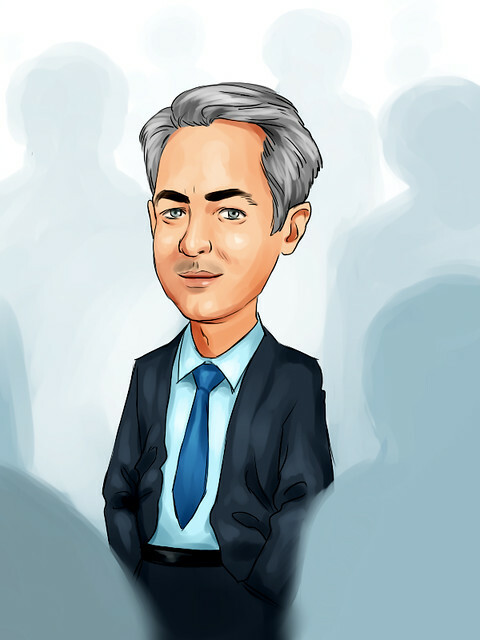 Based on the analysis conducted in this report, Michaels Companies, (MIK:NAS) is found to be Undervalued. 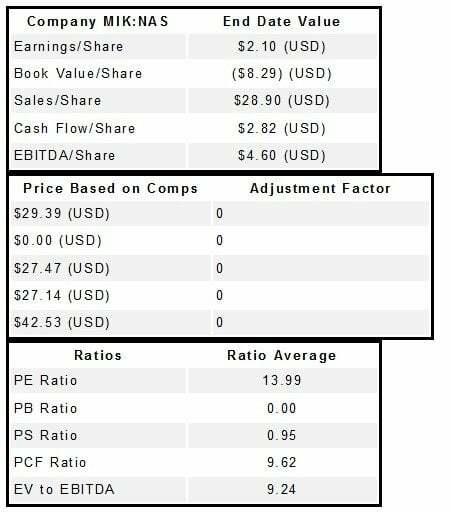 Using similar companies and price based ratios we generated a valuation of $20.83 (USD) for Michaels Companies Inc (MIK). We also generated a valuation of $24.62 (USD) using other metrics and comparables. The comparable companies were Bed Bath & Beyond (BBBY:NAS), Five Below (FIVE:NAS), Murphy (MUSA:NYS), Overstock.com (OSTK:NAS) and Williams-Sonoma (WSM:NYS). 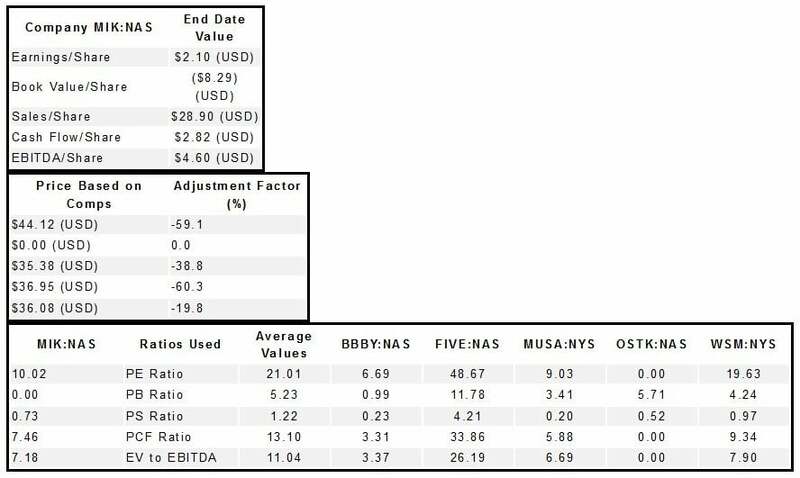 In the Stockcalc database there are 2 analysts that provide a valuation for MIK:NAS. 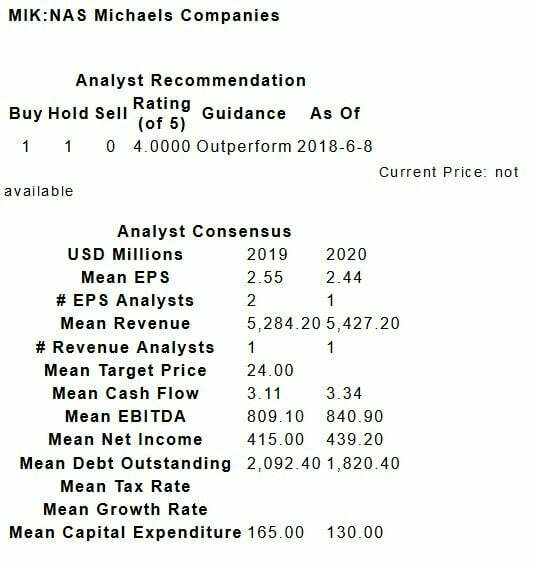 The 2 analysts have a concensus valuation for MIK:NAS for 2019 of $24.00 (USD). The Michaels Companies Inc owns and operates a chain of specialty retail stores in 49 states and Canada featuring arts, crafts, framing, floral, home decor, seasonal merchandise for the hobbyist and do-it-yourself home decorator.